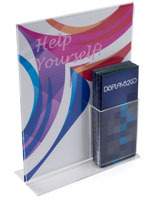 This acrylic sign display that has a brochure pocket is one of the most popular items on this site! 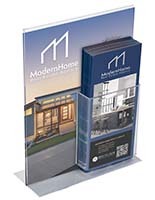 The frame has a slant back style and features an attached literature pocket for standard 4" wide pamphlets. 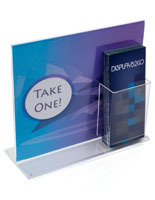 Each acrylic sign display features a pocket that is permanently affixed on the front of the 8.5" x 11" frame. The unobstructed message area to the left of the pocket is approximately 4"wide by 11" high. 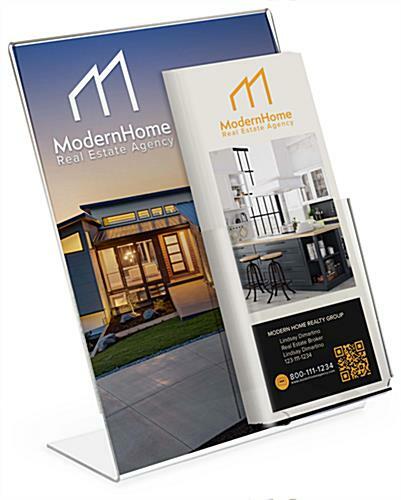 This acrylic sign display is a convenient means of promoting with a colorful advertisement along with a holder for take-home flyers. 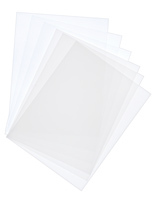 Insert an 8.5" wide by 11" high sheet of paper through the sides. 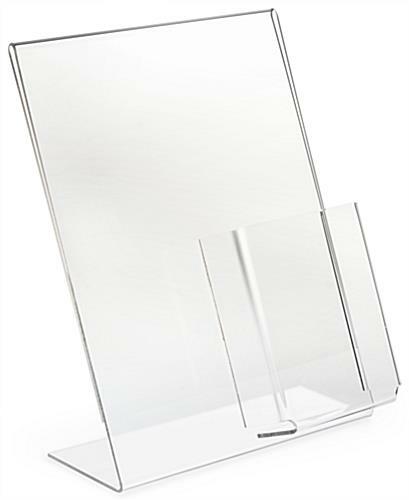 This signage stand, acrylic sign display is used in travel agencies and hotel lobbies to local attractions. The 9 3/4" wide back flap on the frame securely holds the unit in place. 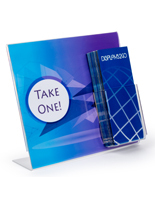 Each acrylic sign display features a brochure holder pocket that is 1.5" deep and 5.5" high with an inside width of 4.125". Shoppers that need a frame with an unobstructed full 8.5" x 11" message area, see the related items. This acrylic sign display can also be customized with a silkscreen logo or slogan on the pocket. Please see the minimum order requirements for more details. 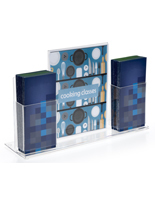 Great item to use for our Lunch & Learn table displays. We're so happy to hear that this sign is working out so well for you, Nita! I have ordered these display frames many times. The quality is very good and they are not too expensive. This produce is perfect for my needs, and I would recommend it. We're happy to hear that, Janet! Thanks for a great review! I bought these for indoor use and I am very pleased with them. Very well made and sturdy. The outside pocket holds materials securely. It was easy to customize with an 8.5" x 11" printed sheet. Excellent Quality, Great Price, Fast Shipping. 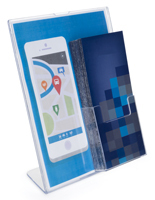 This combination 8.5 x 11 plexi menu stand with an attached tri-fold brochure holder is exactly what I needed for my client. 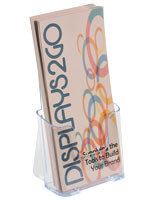 Displays2Go had a few similar options...but this one is designed so that the 8.5 x 11 insert won't/can't slip out when the entire unit is lifted and moved. The attached brochure pocket is beautifully attached to the menu back. There aren't any signs of glue or melted plastic. Hopefully the client will request more. The price is far lower than I could find in any retail office supply store. Thanks for the review, Dave! We're so happy to hear that you and your client were satisfied. These sign holders are great. They look and feel expensive, but aren't.